MUTEK_IMG presents Mixed Realities, featuring free programs on topics as varied as stage and video scenography, wearable technologies, sound spatialization technology and practices, and the distribution and sale of digital visual objects. Artists and professionals in the field of digital creation are invited to connect with high profile local, Canadian and international speakers during conferences, discussions and networking activities. At the core of Mixed Realities is the VR SALON track. Intended for those who seek to create in VR and AR or understand this fast moving medium, it offers comprehensive conferences and networking opportunities as well as an exhibition of over 30 works. Part of a week bursting with VR activities – including workshops and exhibitions by our partners RIDM/DCM, SODEC, and Phi Centre – the VR SALON is conceived as a point of convergence and exchange for creators from Montréal and abroad. 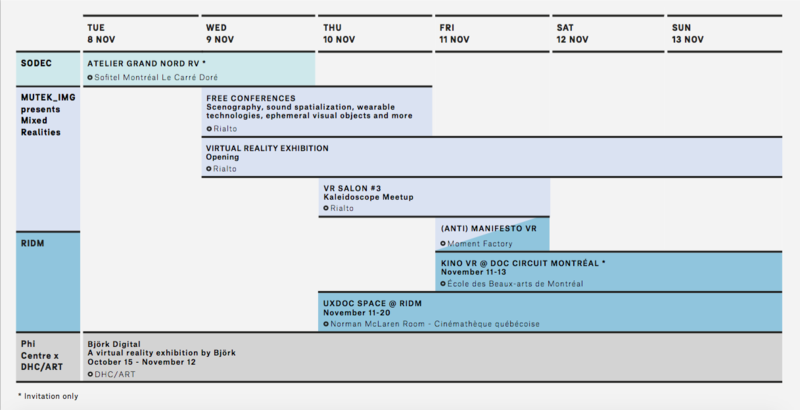 Here is a schedule of VR related activities in Montreal from November 8 to 13, 2016.